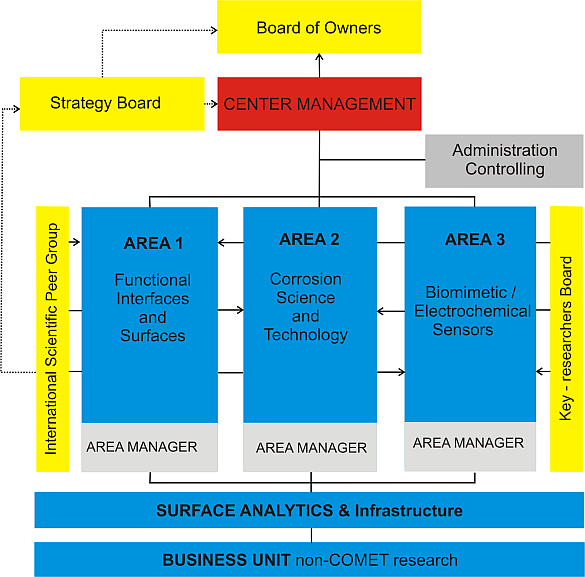 The Strategy Board is the central advisory and controlling body of CEST GmbH with regard to activities within the framework of the COMET programme. The recommendations of the Strategy Board are given considerable weight when it comes to making decisions concerning COMET issues. The operational decision-making authority and final responsibility lies with the general assembly of CEST GmbH, which also appoints the members of the Strategy Board for each funding period. The Strategy Board coordinates the definition of objectives by the corporate and scientific partners and approves applications by its members for presentation to the general assembly. Adaptation and further development of electrochemical and material science characterisation methods. This area provides an arsenal of methods necessary for the successful investigation of industrial problems. This department primarily carries out service functions. All characterisation methods at the competence centre that are not project-specific are prepared and maintained here for the general support of research projects as well as for the provision of external analytical services. This includes, in particular, classic electrochemical methods (e.g. cyclic voltammetry, voltammetry on rotating electrodes, electrochemical impedance spectroscopy), scanning electron microscopy with energy-dispersive X-ray analysis and electron backscatter diffraction, focused ion beam technology and X-ray diffractometry. Spectroscopic methods include Raman and Fourier transform infrared spectroscopy as well as UV/VIS spectroscopy. The techniques are adapted to project-specific requirements when necessary. A number of standard measurement and analysis methods are also available. In this area, complementary methods and techniques are prepared that have not previously been commercially available but that have already been shown to be of potential benefit to questions investigated by CEST. In particular, one research focus of CEST lies in the development and application of local electrochemical in situ analysis methods. CEST collaborate on its projects with experts from the Johannes Kepler University in Linz (JKU Linz), the Vienna University of Technology (TU Wien), the University of Vienna and international scientific partners.